The effects of solar radiation (PAR, UV-A, UV-B) on community productivity and structure were assessed during primary succession of primary producers and consumers on artificial substrate in a rocky shore of the Saronikos Gulf near A. Korinthos, Greece. The communities were exposed to PAR, PAR+UV-A, and PAR+UV-A+UV-B at 0.5, 1.0 and 1.5 meters of depth. Pennate diatoms were the main taxonomic component of the developing periphytic communities during the study period. Exposure to solar UV-B initially reduced the biomass and altered the structure of the diatom assemblages. The highest biomass of diatom assemblages was observed under PAR (49.2 g/m2). This value was significantly higher than the biomass of assemblages growing under PAR+UV-A+UV-B, but not significantly different compared to the biomass of assemblages exposed to PAR+UV-A. These differences, however, did not persist at later stages. The most abundant invertebrate groups present were Polychaetes and Crustaceans. Solar UV-B did not have significant effects on invertebrate biomass. Analysis of the invertebrate assemblage structure revealed time-course differences but no clear trends among the different treatments. Sample separation primarily reflected differences in species number and number of individuals. Key words: algae, grazers, invertebrates, solar UV radiation, artificial substrate, Greece, rocky shore, mesocosm. The rapid decline in stratospheric ozone concentrations results in increased levels of UV radiation, especially UV-B (280-315 nm) incident on the Earth's surface (Madronich et al. 1995, Kerr & McElroy 1993). Peak global losses of ozone are expected around the year 1998-99, coinciding with peak stratospheric chlorine and bromine abundances (World Metereological Organization 1995). The maximum ozone loss relative to the late 1960s will likely be about 6-7% at northern mid latitudes in winter/spring. Short-term UV screening experiments confirm that UV radiation can reduce the growth rates of benthic diatom communities in shallow freshwater during summer at mid-northern latitudes (Bothwell et al. 1994). Prolonged exposure to UV radiation increased diatom biomass and community diversity. This effect was attributed to the greater UV-B susceptibility of grazers (larval chironomids) than their food, the algae. Literature on the effects of UV radiation on periphyton is rather scarce (Schreiber & Pennock 1995, Santas et al. 1996, Santas et al. 1997a). Direct UV-B effects on diatom assemblages grown on ceramic tiles in a natural marine habitat in Saronicos Gulf, Greece included shifts in species composition and temporary inhibition of biomass production (Santas et al. 1996). The sensitivity and tolerance of marine invertebrates to UV-B radiation may vary considerably (Hunter et al. 1982). Cleavage reduction has been observed in sea urchin eggs as a result of exposure to ultraviolet radiation (El Sayed 1988). On the other hand, the egg capsules of the gastropod Nucella emarginata provide embryos with substantial protection from UVR. These capsules allow less than 5% of the incident UV-B at 300 nm and less than 55% of incident UV-A at 360 nm to enter the capsule chamber (Rawlings 1996). The sensitivity of corals to UV-B may depend on the depth at which they grow (Siebeck & Böhm, 1987). A correlation between depth and concentration of UV-absorbing pigments has been found in different organisms (Maragos 1972, Jokiel & York 1982). While our earlier attempts aimed at assessing solar UVR effects on diatom assemblages (Santas et al. 1996, Santas et al. 1997a), in the present study, the role of solar ultraviolet radiation was investigated in the grazers (invertebrates) associated with the diatom assemblages during the process of primary ecological succession in benthic communities of Greece. The experiment was conducted at a distance of 50 m from an east-facing rocky shore of Saronikos Gulf, near Korinthos, Greece (370 58' N, 230 0' E). Using UV-transmitting Plexiglas and plastic foil filters, 9 treatment combinations (3 UV regimes x 3 depths; Table 1) were performed in duplicate. The filters used were UV-transmitting Plexiglas (Plexiglas GS 2458) and plastic cut-off filters, (295 Ultraphan; PR Montagefolie 320 nm Art. Nr. 10155099; and Ultraphan UV Opak; thickness: 0.3mm). Each experimental unit consisted of eight 10x10cm ceramic tiles placed on a polypropylene screen fixed onto a 3/4", 45 x 90 cm PVC frame. The 18 units were suspended in random pairs from nine 2 x 1 m rafts at 0.5, 1.0 and 1.5 m. The rafts were constructed from 2.5" PVC pipe filled with polyurethane for waterproofing and tied together in tiers of three. Each raft tier was anchored at one end only to allow free swinging of the apparatus with the current. The filters were cleaned regularly to prevent alteration of the transmittance properties due to biofouling. Light trasmittance was periodically checked for replacement of defective filters. Attenuation of the PAR, UV-A and UV-B bands in the water column was measured with an Optronic 752 double monochromator spectroradiometer using a sensor in 4p geometry. Irradiance levels at 1.5 m were ca. 35% lower than immediately below the surface for PAR; 20% for UV-A; and 6% for UV-B. Surface irradiance measurements were obtained using an ELDONET dosimeter equipped with three sharp band sensors (Gröbel, Ettlingen) for PAR, UV-A and UV-B calibrated against the 752 Optronic spectroradiometer (Santas et al. 1997b). The signals from the sensors were amplified, digitized and stored in a dedicated computer (Visual Basic program Windose 2000 written by M. Lebert, Univ. of Erlangen, Germany). Daily surface irradiance averages were 10,027 kJ/m2 (PAR), 1,110 kJ/m2 (UV-A), and 28 kJ/m2 (UV-B). The experimental enclosures were placed in the sea on June 17, 1995 (Figure 1). The developing communities were sampled every two weeks for a total of five times during the period July 15 - September 9 by removing one ceramic tile form each treatment. The collected algal biomass was strained free of salt water, and dried to constant weight at 80o C. The samples were processed for microscope community analysis of the diatom assemblage using mild digestion of the cell contents with H2SO4 (Hasle & Fryxel 1970). Fig. 1: Experimental partial enclosure. 18 such experimental units were suspended at 0.5, 1.0 and 1.5 m from nine 2 x 1 m rafts. Sixteen 10 x 10 cm ceramic tiles were placed under each of the 3 light treatments. Invertebrates were collected from each tile, sieved through a 0.5 mm mesh size metal sieve, and the organisms were preserved in 4% formaldehyde. 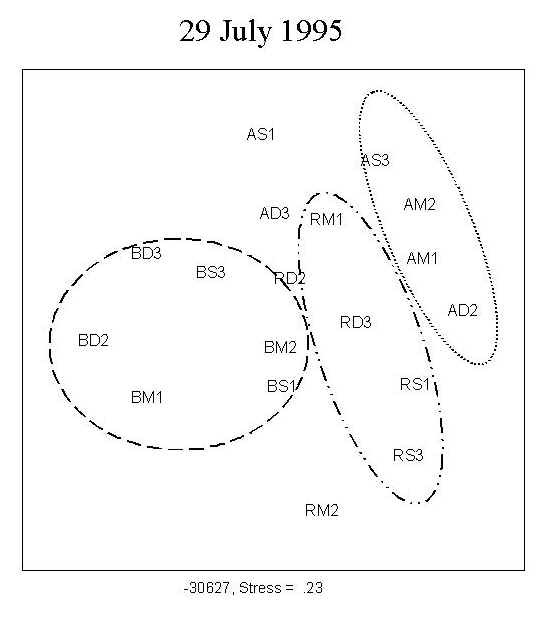 The ecological parameters calculated for each sample were: number of species (S), abundance (N/0.01m2), community diversity H' (Shannon & Weaver 1963), evenness of distribution j (Pielou 1969) and biomass (g/0.01m2). The PRIMER software package (Plymouth Marine Laboratory) was employed to perform multi-dimensional scaling (MDS) community analysis. 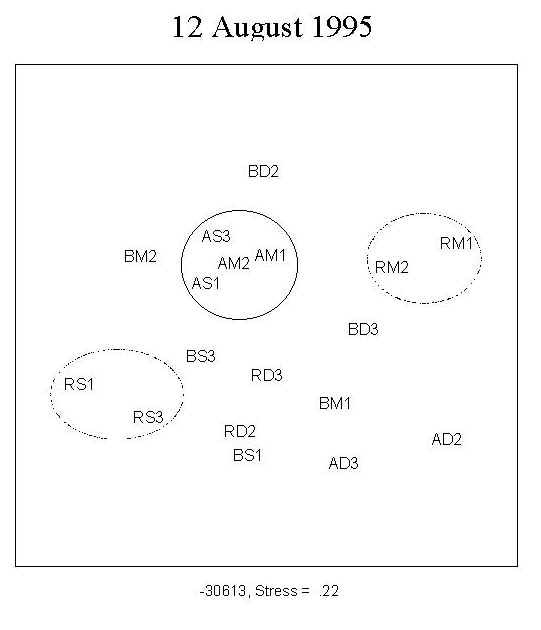 Table 1: Experimental design (n=2): Nine light x depth treatment combinations were performed. A total of 173 diatom taxa were encountered during the course of the experiment under the 9 treatment combinations. 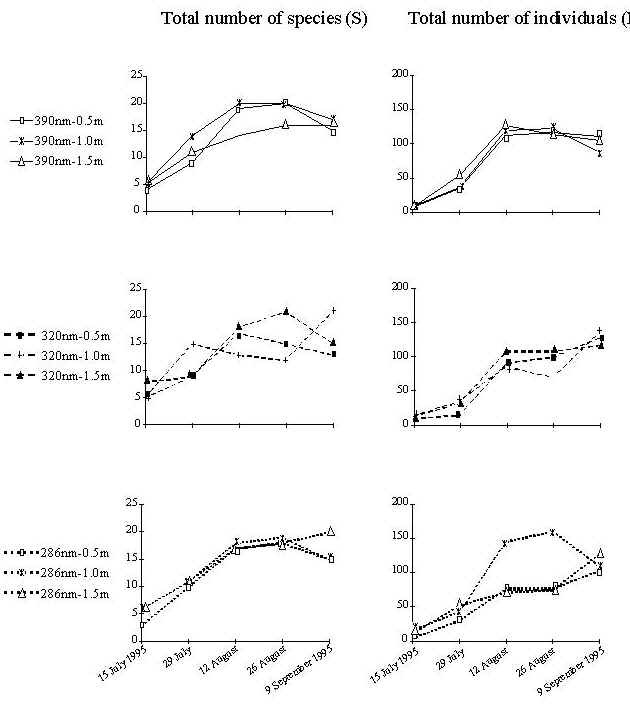 The clear separation of the three UV treatments shown by MDS ordination indicates a UV effect on community structure during the first four weeks of primary succession (Figure 2; 15 July, 29 July). There was no distinct separation of the assemblages into depth-groups during the course of the experiment. Species contributing to the dissimilarity among the different UV radiation treatments a) only under PAR+UV-A+UV-B: Amphora biggiba, A. coffeaeformis, A. inariensis, A. spectabilis, Bacillaria paxillifer, Cocconeis fluminensis, C. pinnata, Climacosphenia elongata, Gyrosigma attenuatum, Mastogloia pumila, Opephora olsenii, Surirella comis; b) only under PAR (no UV-A+UV-B): Amphora graeffi, Opephora martyi; c) under PAR+UV-A+UV-B and PAR+UV-A: Cocconeis costata, Cymbella affinis, Diploneis crabro, D. smithi; d) in PAR+UV-A+UV-B and PAR: Navicula clementis, Nitzschia sigma. Species absent from the PAR treatments include Amphora ostrearia, Cocconeis placentula, Mastogloia corsicana, M. paradoxa, Nitzschia dissipata. The distribution of these species depends on the interaction of UV band and depth. In most cases their abundance tends to decrease as depth increases, with UV being a factor of secondary importance. 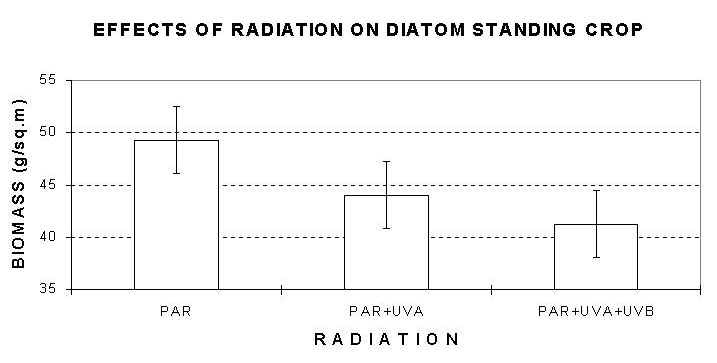 Solar radiation had significant effects on diatom biomass (F=4.82, df=2 and 36, P<0.05). More specifically, the highest biomass of diatom assemblages was observed under PAR (49.2 g/m2, Fig. 3a). This value was significantly higher than the biomass of assemblages under PAR+UV-A+UV-B, but not significantly different compared to the biomass of communities under PAR+UV-A. Fig. 3a (top), 3b (bottom): Mean diatom standing crop after removal of invertebrates. a) effects of solar radiation; b) date by depth effects. Error bars: 95% Confidence Intervals. The effects of depth on diatom biomass depend on the sampling date (F=2.75, df=6 and 36, P<0.05). 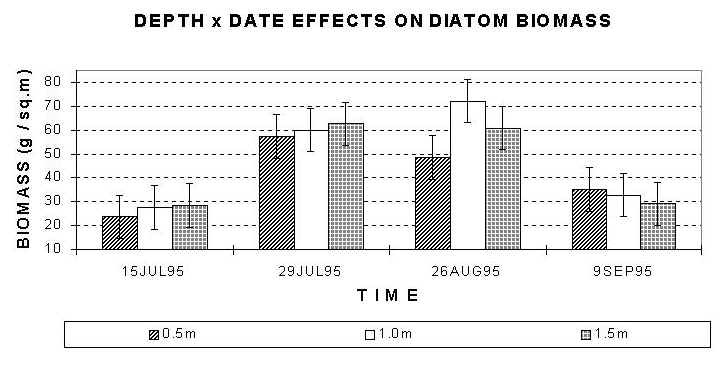 The highest value of diatom biomass was observed on 26 August for the diatom assemblage at 1.0 m depth (Fig. 3b). This value was significantly higher than the biomass at 0.5 m on the same date, but not significantly different from the biomass at 1.5 m on the same date. On any date, except 26 August, biomass at shallow depths (0.5 m) was not statistically different compared to biomass values at other depths.. Fig. 4: Mean total number of invertebrate species (left panel) and mean total number of individuals (right panel) grouped by light and depth. The greatest number of species was recorded on 26 August 1995. A negative correlation was found between wavelength band and total number of individuals. This correlation was not significant (p>0.05). A total of 49 taxa of invertebrates were identified during the study period. The most abundant phyla present were Polychaetes (36.7%) and Crustaceans (35.6%). The total number of invertebrate species is plotted in fig. 4 (left panel). On 15 July 1995, after two weeks of growth, 15 invertebrate species in total were recorded under all treatments. Crustaceans were the most abundant group. Among them, the amphipod Caprella acanthifera and copepods were dominant. Two polychaete species, Platynereis dumerilii and Syllis hyalina, were also present in high numbers. On 29 July 1995 (four weeks of growth) the total number of species doubled to 30. The tanaid Leptochelia savignyi was the dominant crustacean. Platynereis dumerilii was the dominant polychaete, while Perinereis cultifera, Syllis hyalina and Syllis cornuta were present in significant numbers. On 12 August 1995 (6 weeks of growth) the number of species increased further (39), with a remarkable concomitant increase in total number of individuals (Fig.4, right panel). Among polychaetes, the dominant species were the same as in the second sampling date. Among the crustaceans, in addition to Leptochelia savignyi, which remained the dominant species, barnacles, copepods, decapods and amphipods (Elasmopus rapax, Amphithoe ramondi, Caprella acanthifera) were common. Anthozoans were also present in lower numbers. The greatest number of species (41) was recorded on 26 August 1995 (8 weeks of growth). Nudibranchs were the most common molluscs; members of the families Nereidae and Syllidae the most common polychaetes; and copepods, barnacles and Leptochelia savignyi were the most common crustaceans. Anthozoans and foraminiferans were also abundant. Finally, on 9 September 1995 (10 weeks of growth) 39 species were present. In addition to the previously described taxa, the polychaete Polyophthalmus pictus was present in high numbers. Leptochelia savignyi and copepods were the most abundant crustaceans, while several anthozoans and foraminiferans were also present. Species diversity and evenness generally follow similar trends (Fig.5). Species number (S), diversity (H'), abundance (N) and total biomass (g) increased during the first 8 weeks of the experiment. The sharpest increase in relative abundance in almost all treatments occurred between 4 and 6 weeks. This increase was even more dramatic in the PAR+UV-A+UV-B treatment at 1.0 m. The highest number of individuals was also found in the same treatment on 26 August 1995 (8 weeks). However, this value dropped dramatically on 9 September 1995 (10 weeks). The highest value of diversity (H') was recorded on 26 August 1995 (8 weeks) in the PAR treatment at 0.5 m (H'=2.46). Correlation analysis did not reveal strong associations of community parameters with either light or depth. 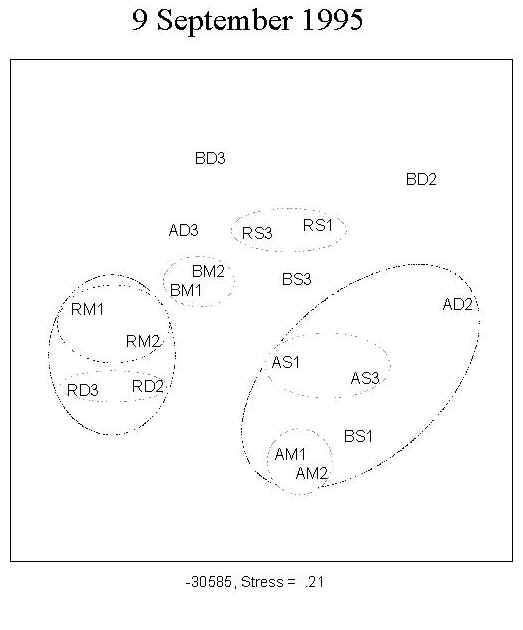 Clustering of the invertebrate assemblages also revealed time-course differences but no clear trends among the different UV-depth treatment combinations. 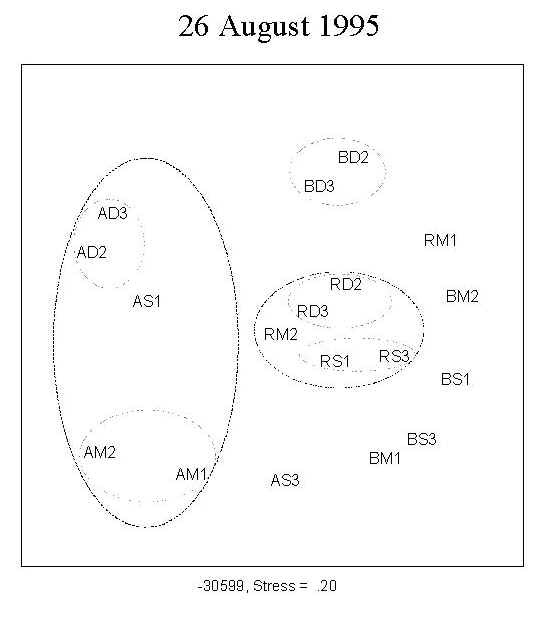 Differences in community structure primarily reflected differences in species number and number of individuals. Fig. 6: Mean values of invertebrate biomass. Invertebrate biomass values during the early stage of the study period (15 and 29 July) were significantly lower than the corresponding values during the middle and the end of the study period. Error bars: 95% Confidence Intervals. Time had significant effects on biomass of invertebrate assemblages (F=10.28, df=4 and 45, P<0.05). 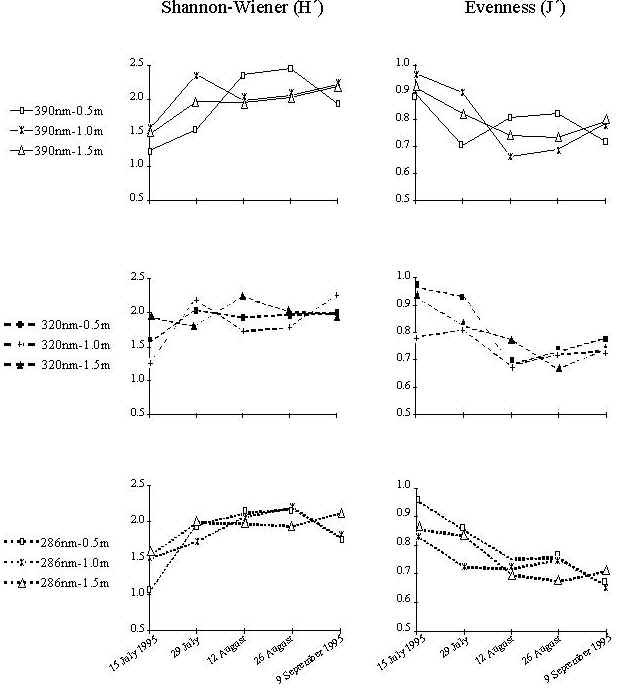 Invertebrate biomass values during the early stage of the study period (July 15 and 29) were significantly lower than during the second half of the study period (Figure 6). However, these values stabilized and no significant differences were observed after August 12. Numerous studies have examined solar UV radiation effects on isolated marine photosynthetic organisms (Schreiber & Pennock 1995, Archer 1995, Hansson 1995, Stewart 1995, Tamigneaux et al. 1995). The understanding of ecosystem functions, however, also requires analysis at the population, assemblage and community levels. The structural differences between the diatom assemblages were more pronounced during the early stages of the experiment (first 3 sampling dates), and became less clear in the second half. The same pattern was observed in a previous experiment in 1994. The first stage of separation is probably due to the presence of several UV sensitive species in the UV protected assemblages. The weakening of structural differences at later stages can be attributed partly to the inherent capacity of periphytic communities to adapt to increased solar UV-B irradiance, and partly to the masking interaction effects of grazing and primary succession. The structural differences in the diatom assemblages due to light treatment were not accompanied by similar changes in the structure of the invertebrate assemblages: the structure of the invertebrate assemblages correlated with time, but no clear trends were found among the different UV-depth treatment combinations. Many of the dominant invertebrate species were photophilic and/or characteristic of hard substrate. Their diet mainly consists of macroalgae, diatoms and detritus, while some feed on hydroids, bryozoans and other invertebrates. A possible explanation might be that smaller organisms with shorter life cycles such as bacteria and microalgae are likely to be more susceptible to UV than larger organisms (Karentz et al. 1994). 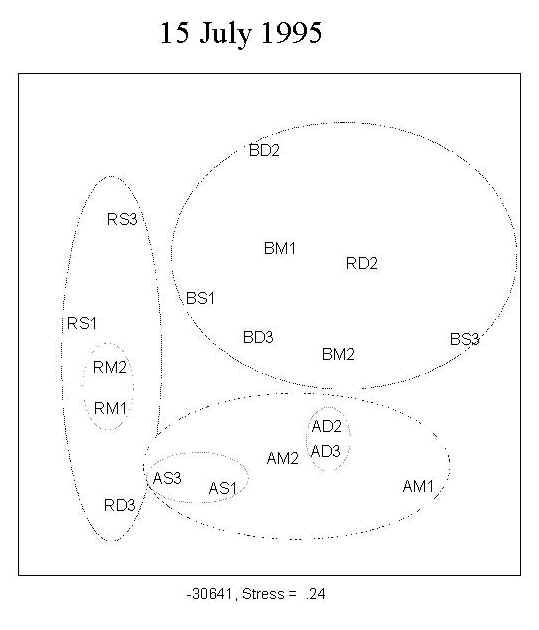 Sampling area size and homogeneity might have been two possible sources of error in identifying differences in the structure of the invertebrate assemblages. The 10 x 10 cm surface area of the ceramic tiles was adequate for analyzing diatom assemblages, but might have been too small for motile animal organisms. Moreover, natural ecosystems are characterized by a large variety of microhabitats and niches as opposed to the flat configuration of the ceramic tiles used. Keeping the experimental design simple, however, was a necessary compromise in standardizing the sampling and analysis procedures. 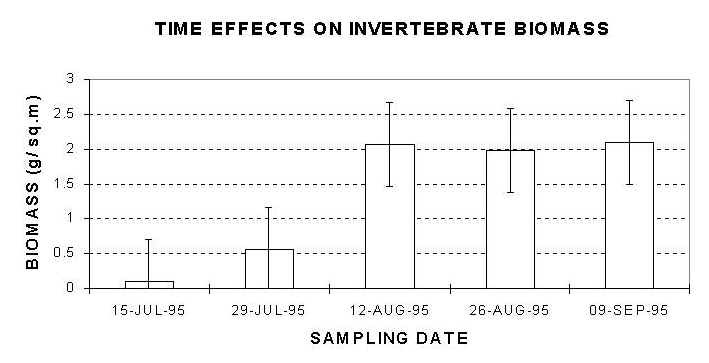 The increased grazing pressure resulting from the sharp increase in the total number of invertebrate individuals on 12.8.95 in all treatment combinations (figure 4) caused a decrease in the diatom biomass on 26.8.95. The total number of invertebrate individuals generally remained constant thereafter with the exception of the last sampling event. Bothwell et al. (1994) reported that enhanced UV-B reduced grazer abundance resulting in increased primary producer biomass, while solar UV-B did not reduce grazer numbers or increase primary production in the present study. These differences can be attributed to: a) the different experimental conditions of the two studies (natural marine environment under naturally occurring of solar UV-B as opposed to artificial freshwater flumes exposed to enhanced UV-B); and b) the larger number of grazer species of the present study vs. the dominance of a single group (chironomids). Increased UV-B radiation is probably a stress on intertidal marine communities. Since primary producers are a fundamental component of most ecosystems, UV-B may be an important factor for niche separation, trophic chain and community structure. However, factors such as substrate hardness and porosity, food type, seasonality, turbulence, etc. may cloud the effects of solar ultraviolet radiation. The results of the present study as well as of other reports (Worrest et al. 1978, Santas et al. 1996, Santas et al. 1997a) suggest that community structure can be used in predicting ecosystem responses to the increase in solar UV-B. However, UV effects cannot be easily separated from the effects of many other environmental factors in the natural ecosystem. Therefore, the understanding of large-scale UV effects requires long-term field investigations on the interaction of such factors on biological systems. This study was supported by grant EV5V-CT94-0425, DG-XII, European Commission. Archer, D. (1995). Upper ocean physics as relevant to ecosysten dynamics: A tutorial. Ecol. Appl. 5: 724-739. Bothwell, M.L., Sherbot, D.M.J., Pollock, C.M. (1994). Ecosystem response to solar ultraviolet-B radiation: Influence of trophic level interactions. Science 256: 97-100. El Sayed, S.Z. (1988). Fragile life under the ozone hole. Natural history 97: 73-80. Hansson, L.A. (1995). Diurnal recruitment patterns in algae: Effects of light cycles and stratified conditions. J. Phycol. 31(4): 540-546. Hasle, G., Fryxel, G. (1970). Diatoms: Cleaning and mounting for light and Electron Microscopy. Trans. Amer. Microsc. Soc. 89(4)1: 469-474. Hunter, J.R., Kaupp, S.E., Taylor, J.H. (1982). Assessment of effects of UV radiation on marine fish larvae. In: Calkins, J. (ed.) The Role of Solar Ultraviolet Radiation in Marine Ecosystems, New York: Plenum Press., p.459-497. Jokiel, P.L., York, H.R. (1982). Solar ultraviolet photobiology of the reef coral Pocillopora damicornis and symbiontic zooxanthellae. Bull. Mar. Sci. 32: 301-315. Karentz, D., Bothwell, M.L., Coffin, R.B., Hanson, A., Herndl, G.J., Kilham, S.S., Lesser, M.P., Lindell, M., Moeller, R.E., Morris, D.P., Neale, P.J., Sanders, R.W., Weiler, C.S., Wetzel, R.G. (1994). Impact of UV-B radiation on pelagic freshwater ecosystem: Report of working group on bacteria and phytoplankton, Arch. Hydrobiol. Kerr, J.B., McElroy, C.T. (1993). Evidence for large upward trends of ultraviolet-B radiation linked to ozone depletion. Science 262 (5136): 1032-1034. Madronich, S., Mckenzie, R.L., Caldwell, M., Björn, L.O. (1995). Changes in UV radiation reaching the earth's surface. Ambio 24: 143-152. Maragos, J.E. (1972). A study of the ecology of the Hawaiian reef corals. Ph.D. thesis, Univ. of Hawaii. Pielou, E.C. (1969). An Introduction to mathematical ecology. Wiley Interscience, New York, 289p. Rawlings, T.A. (1996). Shields against ultraviolet radiation: An additional protective role for the egg capsules of benthic marine gastropods. Mar. Ecol. Progr. Ser. 136: 1-3. Santas R., Häder, D.-P., Lianou, C. (1996). Effects of solar UV radiation on diatom assemblages of the Mediterranean. Photochem. Photobiol. 64(3): 435-439. Santas R., Danielidis, D., Lianou, C. (1997a). UV-B Radiation and Depth Interaction during Primary Succession of Marine Diatom Assemblages of Greece. Limnol. Ocean. 42(5): 986-991). Santas, R., Koussoulaki, A., Häder, D.-P. (1997b). In assessing biological UV-B effects, natural fluctuations of solar radiation should be taken into account. Plant Ecol. 128: 93-97. Schreiber R.A., Pennock, J.R. (1995). The relative contribution of benthic microalgae to total microalgal production in a shallow sub-tidal estuarine environment. Ophelia 42: 335-352. Shannon, C.E., Weaver, W. (1963). The mathematical theory of communication. University of Illinois Press, Urbana, Illinois, 117p. Siebeck, O., Böhm, U. (1987). Untersuchungen zur Wirkung der UV-B-Strahlung auf kleine Wassertiere. BPT Bericht, Gesellschaft für Strahlen- und Umweltforschung, München, 84p. Stewart, P. M. (1995). Use of algae in aquatic pollution assessment. Nat. Area J. 15: 234-239. Tamigneaux, E., Vasquez, E., Mingelbier, M., Klein, B., Legendre, L. (1995). Environmental control of phytoplankton assemblages in nearshore marine waters, with special emphasis on phototrophic ultraplankton. J. Plankton Res. 17: 1421-1448. World Meteorological Organization (1995) Scientific Assessment of Ozone Depletion (1994). Global Ozone Research and Monitoring Project  Report No. 37. Geneva, Switzerland. Worrest, R.C., Van Dyke, H., Thomson, D. (1978). Impact of enhanced simulated solar ultraviolet radiation upon a marine community. Photochem. Photobiol. 27: 471-478.